This Roasted Sweet Potato is a beautiful combination of sweet, tangy and crunchy! Perfect as a side dish for a holiday dinner party, Christmas feast and great for winter or summer! This is one festive salad, guaranteed to be a total hit at the dinner table! This salad reminds me of summer! Which is silly, because apparently, pomegranates are a winter fruit…which also makes sense that it’s a summer salad to me because Australia gets their pomegranates from California, which are in season on the winter in the Northern Hemisphere! 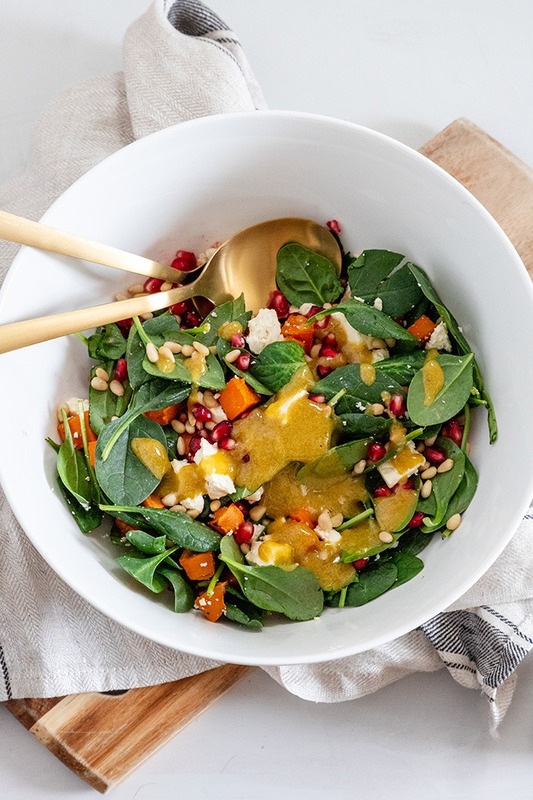 This also leaves me in a little bit of a predicament, because I feel like this is a Summer salad, but in reality, it’s a Winter salad because it features some EPIC Winter produce! That is I guess though if you’re in the norther hemisphere? Sometimes blogging for two different countries is confusing. But seriously, how good (and underrated) are pomegranates. They are actually my favourite fruit and I always get so excited to see them in the supermarkets, especially when they are 2 for $5!!! Oh em geee… gimme all of them! So after that long rant, aside from the fact that you know a little bit more about pomegranates and different hemisphere seasons, you would have figured that I really, really, really like this salad and LOVE pomegranate! 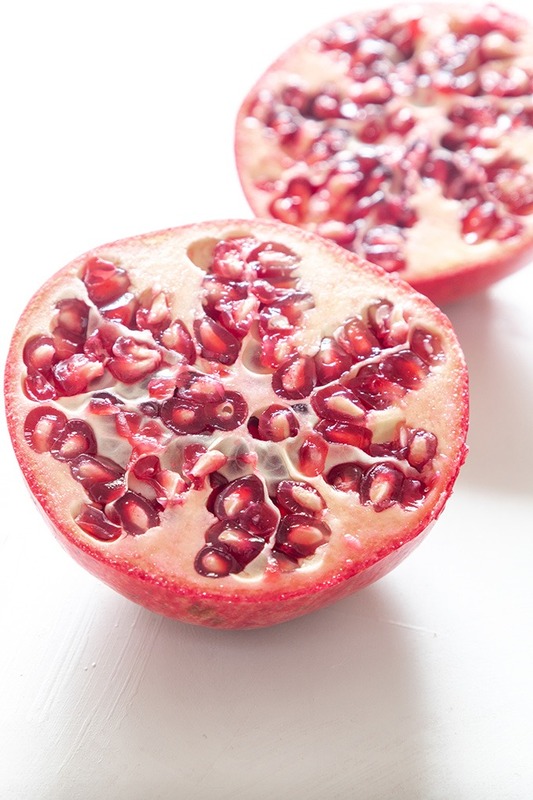 Pomegranate is one of my favourite fruits, even if it is a little pesky to peel and pit! 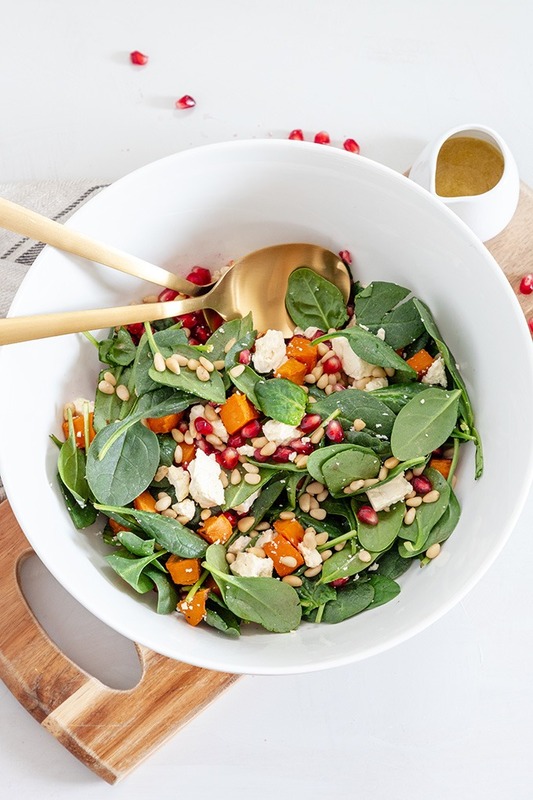 I have a lot of winter/hearty salads on the blog, like panzanella salad, beetroot goat cheese salad and pumpkin spinach feta salad, but for some reason I always forget about this salad until around Christmas time. And I don’t know why! Must be the red and green combination? But seriously, this sweet potato pomegrate feta salad…I die. This salad is actually one that Adam created, and you’ll absolutely love the flavor combination! This is super simple, requiring a few ingredients, but don’t be fooled, this salad does not skimp on flavour! You’ll want a relatively firm pomegranate, that’s dark in color without any squishy bits. Squishy bits indicates the pomegranate is bruised and will yield brown fruit. The heavier the pomegranate, the more pomegranate seeds the pomegranate will yield. I start by cutting my pomegranate in half with a sharp knife, on a chopping board. Use a chopping board that you don’t really care about like a plastic board, because it will stain from the juices. To extract the pomegranates, you’ll want to hold the pomegranate over a large bowl, and grab a wooden spoon. 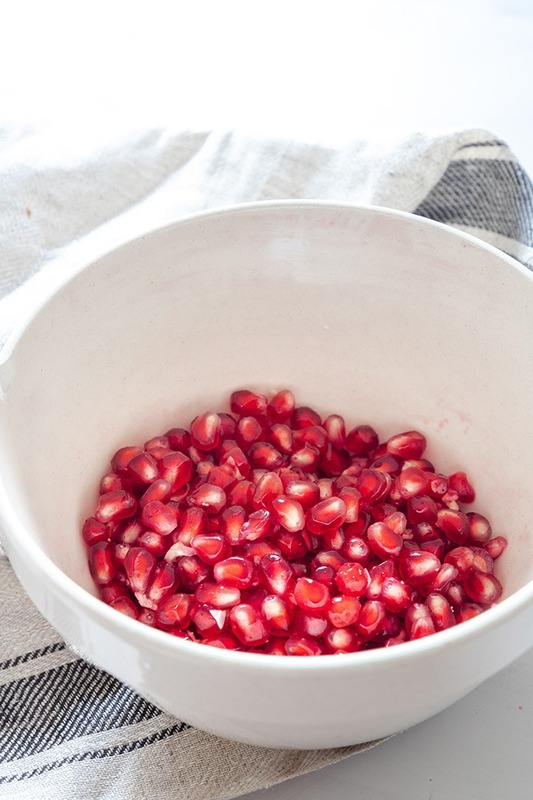 Next, you literally ‘spank’ it with the wooden spoon over the bowl, and the pomegranate seeds should fall into the bowl! The key tip I have for roasting and cutting your sweet potato, is to make sure the diced sweet potato is roughly the same size. The more even pieces are, the more even the sweet potato will cook. You’ll want to cook the sweet potato until it’s nice and crispy and caramelized on the outside, without being overly burnt. This is the simple part! 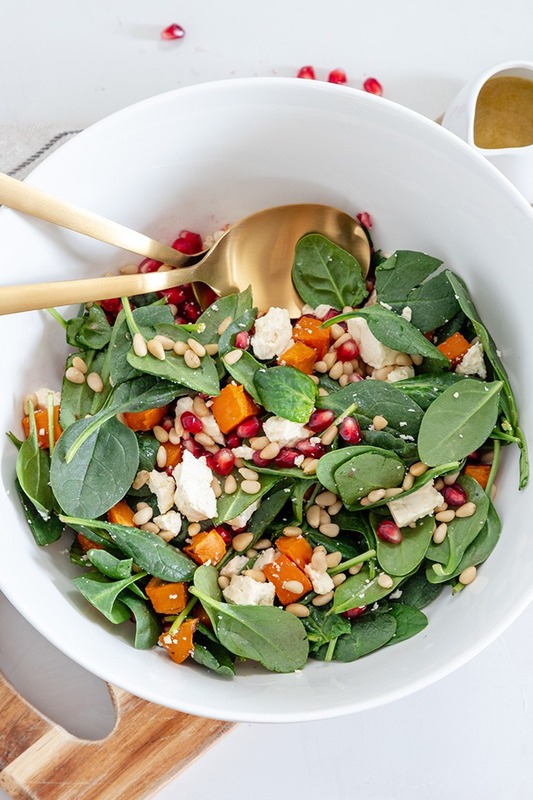 Roughly chop some fresh spinach leaves, add the sweet potato, pomegranate and feta. Top with the pine nuts and honey mustard dressing to bring it all together! You can’t go past the bright colours, the crunch of the pine nuts, sweetness of the potato and pomegranate and tanginess of the feta. It’s actually a flavour and texture combination made in heaven! This salad is so festive looking, perfect for the dinner table at Christmas, in both the southern and northern hemisphere!! 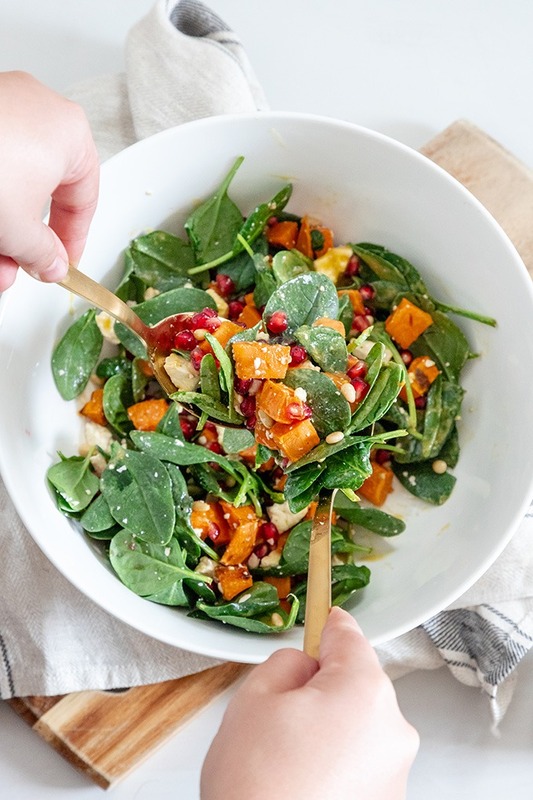 With vibrant colors, and fresh flavors, this roasted sweet potato salad is perfect for the dinner table this Christmas! 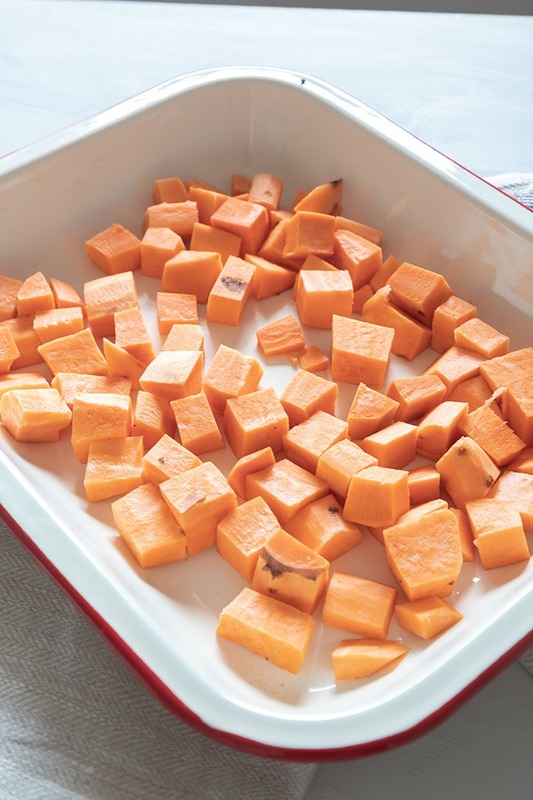 Peel sweet potato and dice into 2cm/1 inch cubes. Toss sweet potato in about 1/2 tablespoon of olive oil and season with salt and pepper. Add spinach to a small salad bowl. Top with sweet potato, feta, pomegranate seeds and pinenuts. Combine all ingredients in a jar and shake until well combined. Toss the salad with the dressing, serve and enjoy! This recipe originally appeared on the blog in 2016 and has been updated with fancy new photos and recipe tips! What a great winter salad. I love the addition of pomegranate. thank you! The pomegranate adds just a hint of tartness! Love the sound of this recipe! And so funny that you think of pomegranate as a summer fruit bc it’s coming to you from Cali during our winter, your summer! it’s super confusing ha ha! Australia imports California pomegranates I think, hence why they are all over the supermarkets in summer! Northern hemisphere over here! ?‍♀️This is totally what I would consider a winter salad. Roasted sweet potatoes with pomegranate has winter written all over it for me 🙂 . Looks amazing and perfect for the season for us right now! ha ha I think I do too!! It’s a tricky one but it’s actually perfect in hot weather too! Oh what a festive winter salad! Love it. This is my kind of food. I love roasted veggies in salads. It looks so good, can’t wait to give it a try asap! ha ha thanks Ben! It’s really delicious, especially with the honey mustard dressing! What a beautiful, colorful, and tasty looking salad. This is the kind of salad that a guy could eat a few times a week to get through the day. ha ha thanks Ben! it’s great with the honey mustard dressing! The colors alone are amazing! We are huge on salads and this looks light and refreshing. thanks Sandi! I love the colors too, they’re super festive and look gorgeous in a big white bowl on the dinner table! 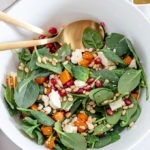 This salad is so light and gorgeous!! I have never tried this combo before, but this sounds amazing.